Arguments have consequences in world politics that are as real as the military forces of states or the balance of power among them. Neta Crawford reveals how ethical arguments, not power politics or economics, explain decolonization, the greatest change in world politics to occur over the last five hundred years. 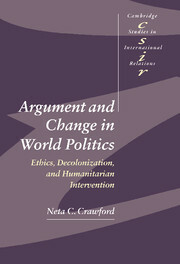 The book also analyzes how argument might be used to to remake contemporary world politics, suggesting how such arguments apply to the issue of humanitarian intervention. 1. Argument, belief and culture; 2. Ethical argument and argument analysis; 3. Colonial arguments; 4. Decolonizing bodies: ending slavery and denormalizing forced labour; 5. Faces of humanitarianism, rivers of blood; 6. Sacred trust; 7. Self-determination; 8. Alternative explanations, counterfactuals and causation; 9. Poesis and praxis: toward ethical world politics.